A woman seeking to become a strategist of Sōsō's forces, and is also romantically attracted to the warlord. She ends up becoming Sōsō's bodyguard instead, much to her chargin. Later her talent as a strategist is accepted by Sōsō who realizes she's much suitable to be her strategist. Teiiku calls her Icchan (いっちゃん). 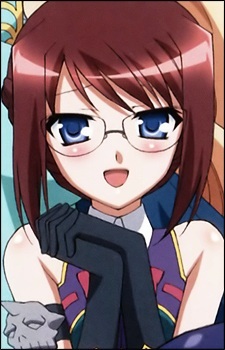 A bespectacled female strategist and a new character in the sequel, Shin Koihime Musō. She easily gets nosebleeds when having perverted thoughts, and as a result is sometimes found passed out on the ground and often mistaken to be dead (due to a pool of blood from her nosebleeding).